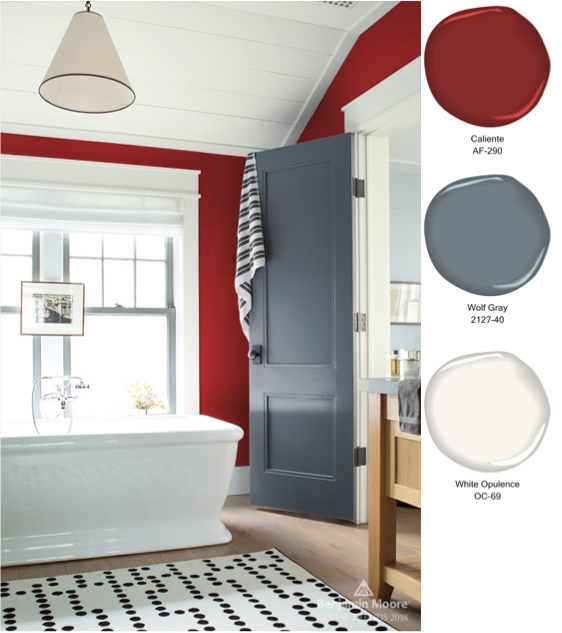 Bold, red accessories are potent ingredients in this living room painted in Wolf Gray. 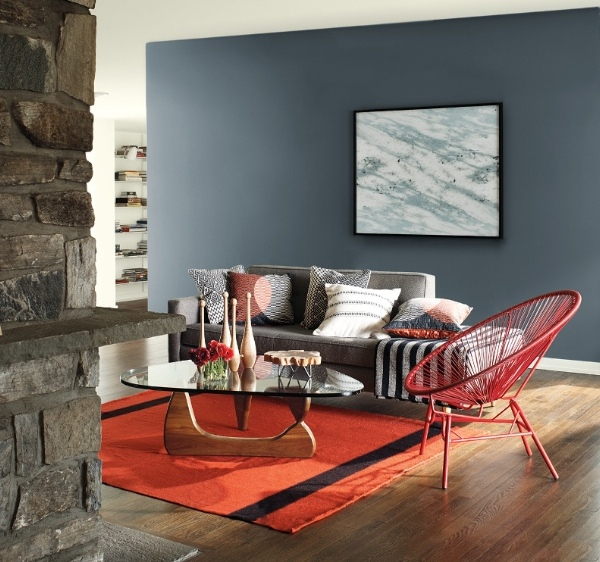 In October we announced our 2018 Colour of the Year, Caliente AF-290, reflecting a predicted shift to more confident and dramatic interiors in 2018. 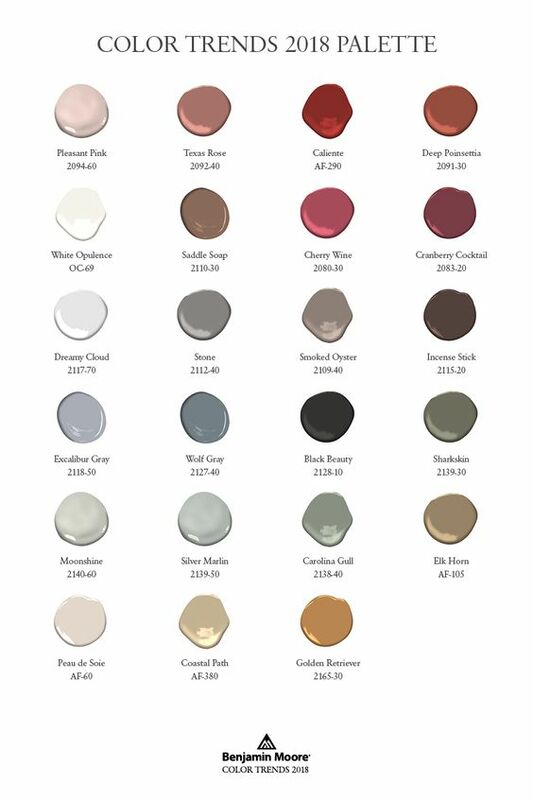 Alongside our Colour of the Year 2018 sits a beautiful collection of 23 hues from the red family, from hints of blush to deep oxbloods, as well as a carefully curated range of bold complementary shades and cool neutrals that can all stand alone or come together in endless combinations. 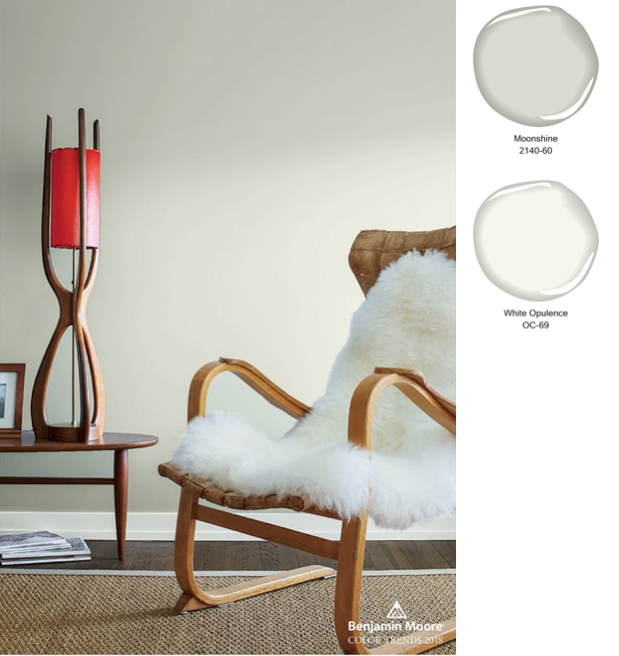 Whether you're inspired to use one of the more vibrant shades to bring depth and energy to your space, or whether you're looking to incorporate this year's "on-trend" colours as accents to give a cheerful pop of colour, our 2018 Colour Trends palette is versatile enough to create statement spaces that are warm, enveloping and full of personality. 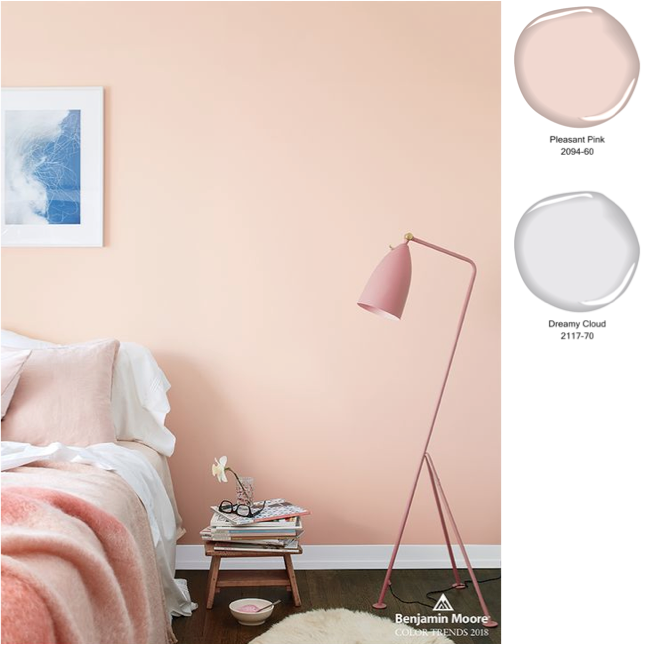 So this month we are featuring ideas for bedrooms, living spaces and bathrooms that bring our 2018 Colour Trends palette to life and will inspire you to inject strength, confidence and vitality into your scheme. The depth of Black Beauty enriches this elegant, understated living room. 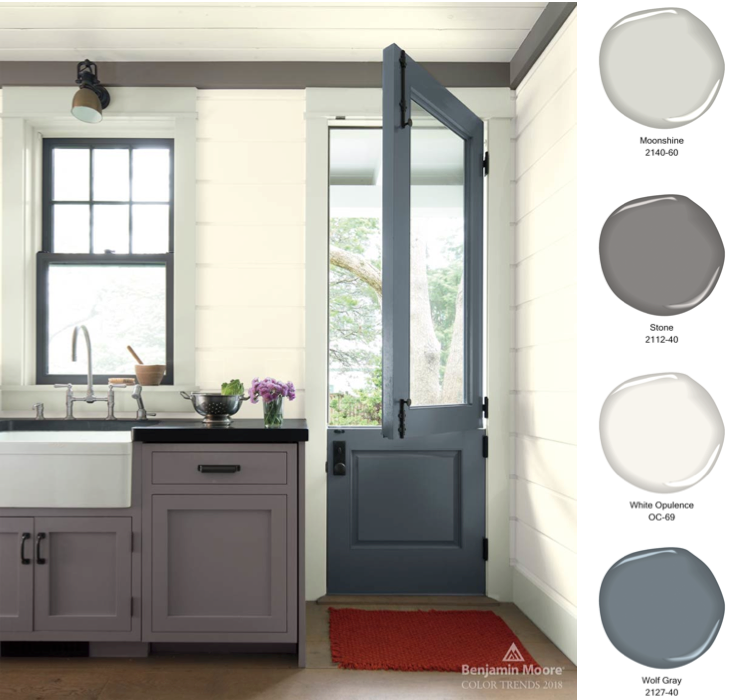 A simple red welcome mat on a kitchen floor brings instant personality to this country kitchen painted in White Opulence, Wolf Gray and Stone with Moonshine accents. 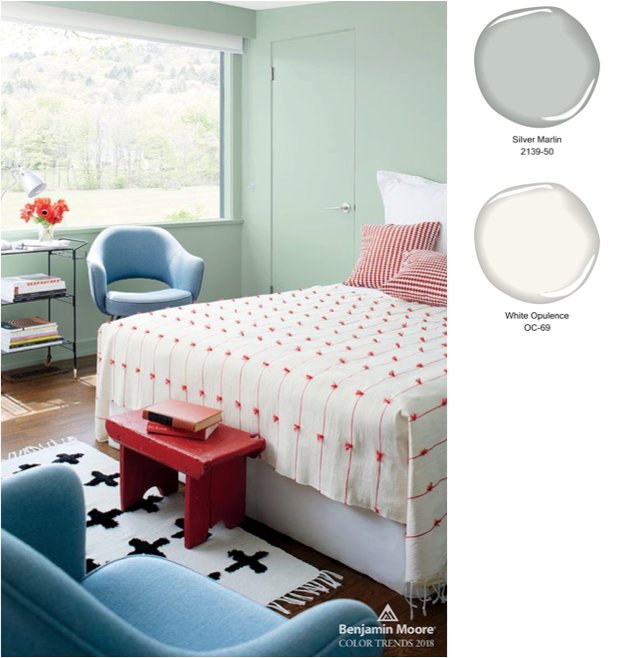 A vintage red velvet bench at the foot of an iron-framed bed energizes a room painted in Excalibur Gray. 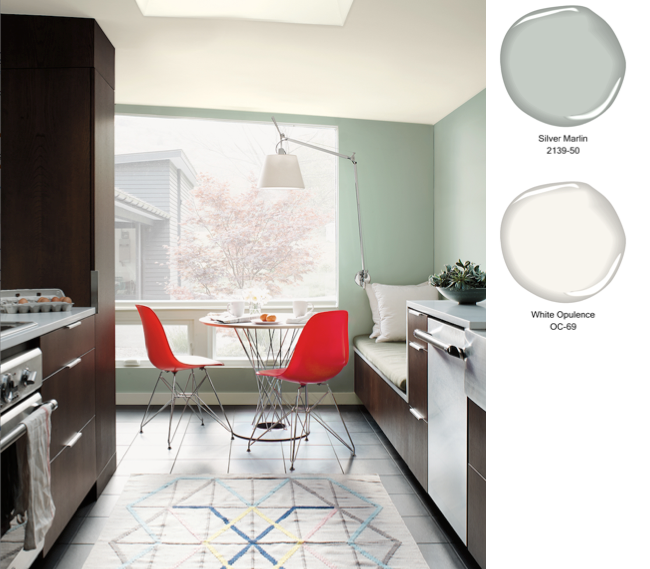 Pairing our warm, neutral Stone with White Opulence gives this kitchen a modern look. 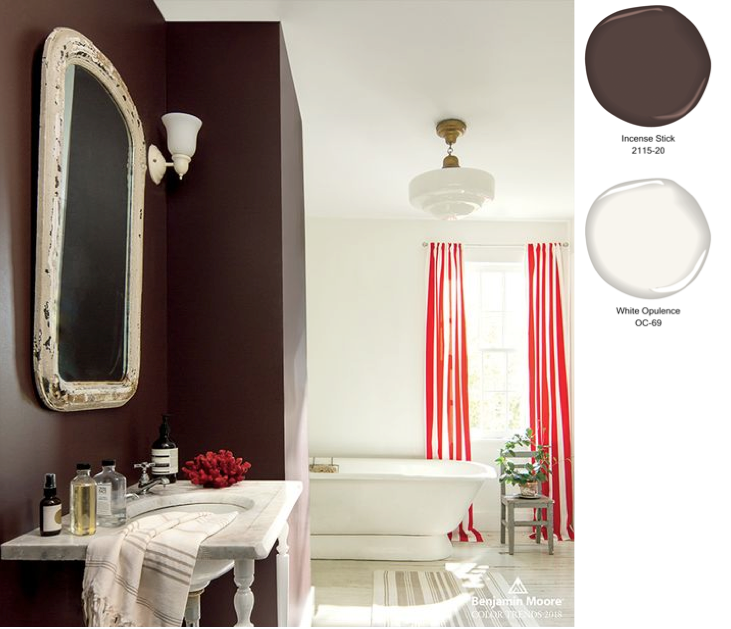 This bathroom balances deep and neutral colours to give off a serene look. 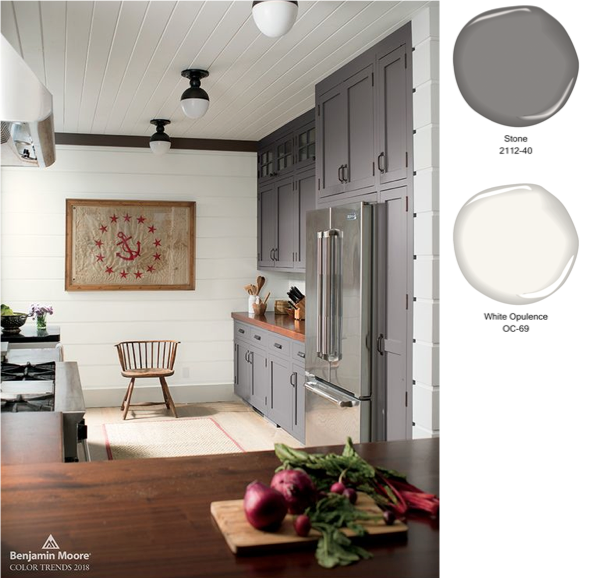 The serene Silver Marlin paired with dark wood cabinets creates a modern, sharp look. Add a pop of red with an iconic chair. Colour flows seamlessly between this bedroom and ensuite by combining two coordinating favorites from the spectrum of reds and blush tones. 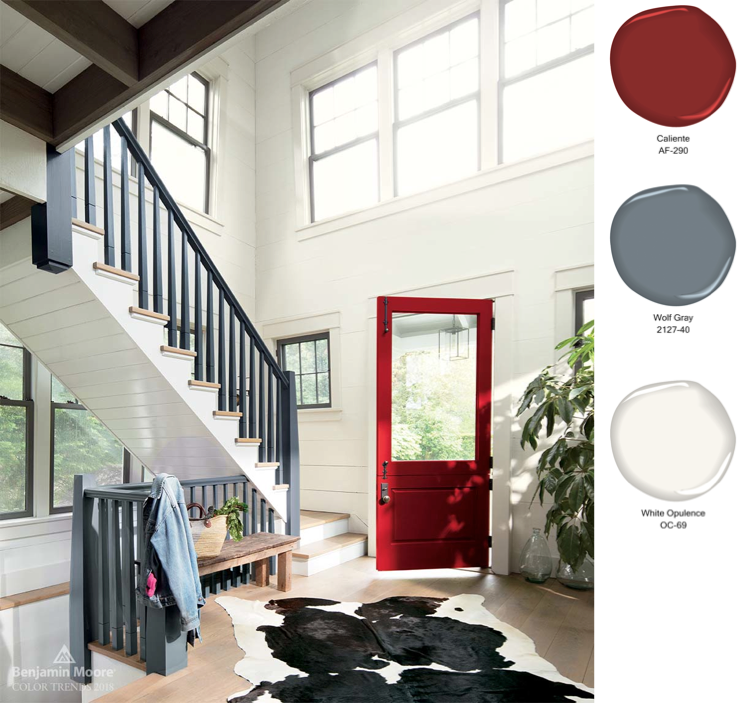 A symbolic red door painted in Caliente AF-290 announces an enthusiastic welcome in this classic seaside summerhouse. 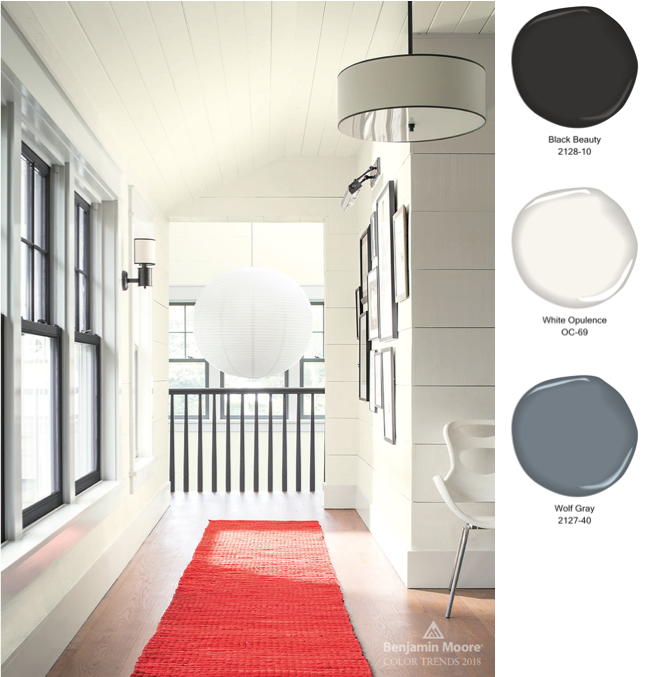 This corridor redefines "red carpet treatment" with Black Beauty on window woodwork and hand rails. 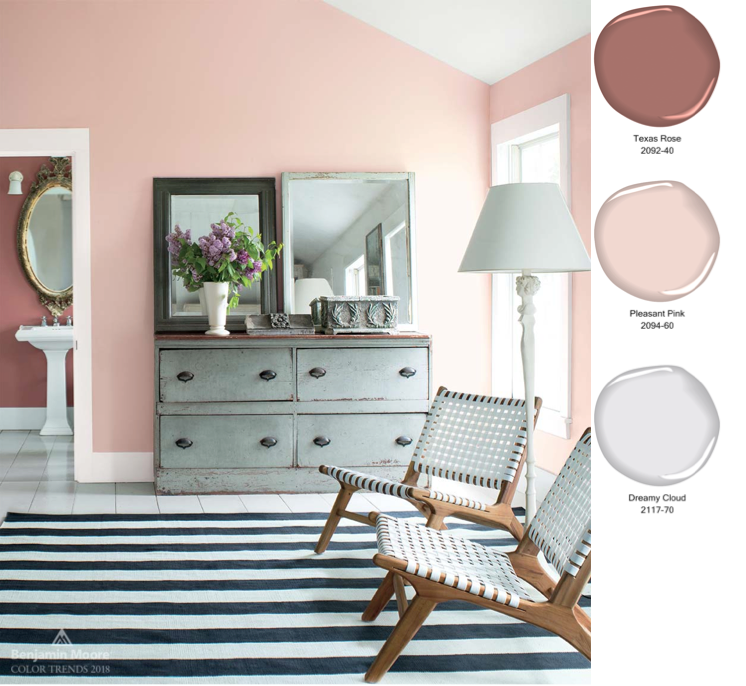 Pleasant Pink provides a soft flattering touch, yet a lot of atmosphere. 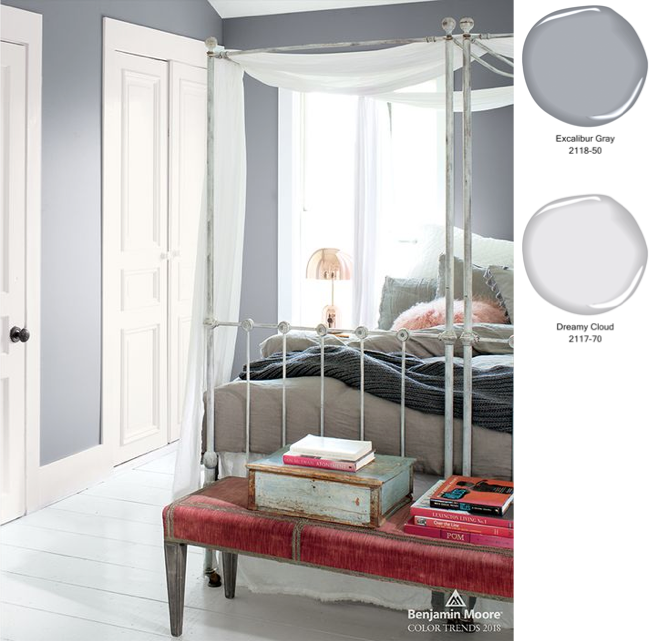 This calming bedroom pairs Silver Marlin with neutral fabrics and accessories. Bright accessories like these red pillows help brighten up a room with neutral Wolf Gray walls. 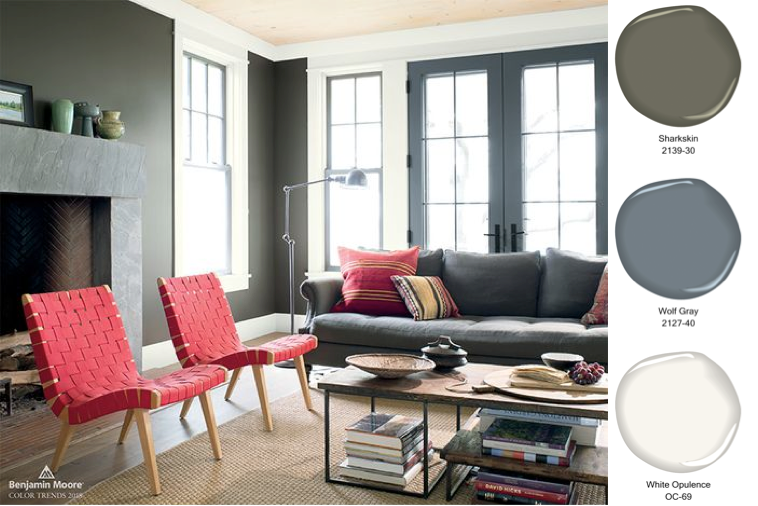 A contemporary corner with layers of neutrals and textures and a bright pop of red. This bathroom accent wall in Incense Stick adds drama alongside airy White Opulence. Red accents provide a powerful counterpoint to the monochromatic, neutral Sharkskin colour scheme framed by White Opulence trim. A child�s red wooden bench and a red pom pom-accented bedspread are happy notes in this relaxing guestroom painted in Silver Marlin. 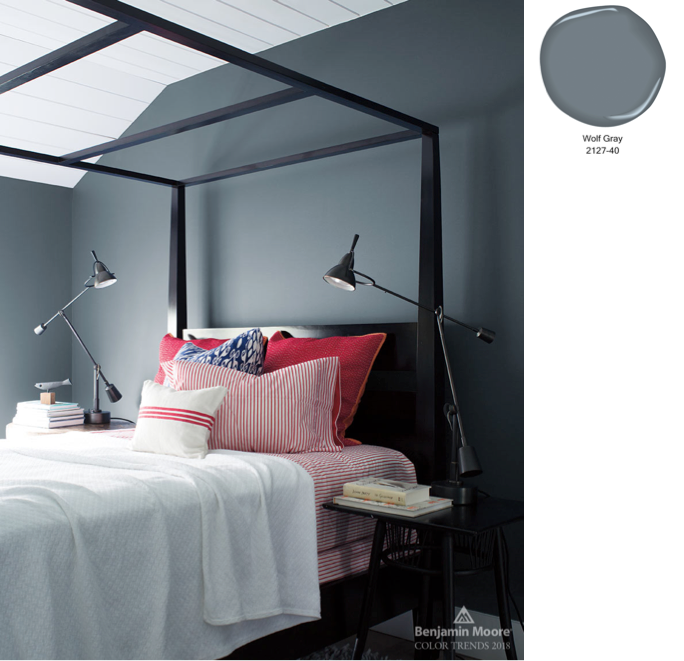 Benjamin Moore Aura� is the ideal paint for creating dramatic schemes with bold saturated colours. 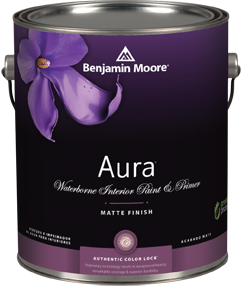 Aura uses Colourlock technology to encapsulate pigments within the paint, ensuring they are protected from fade and colour rub-off. 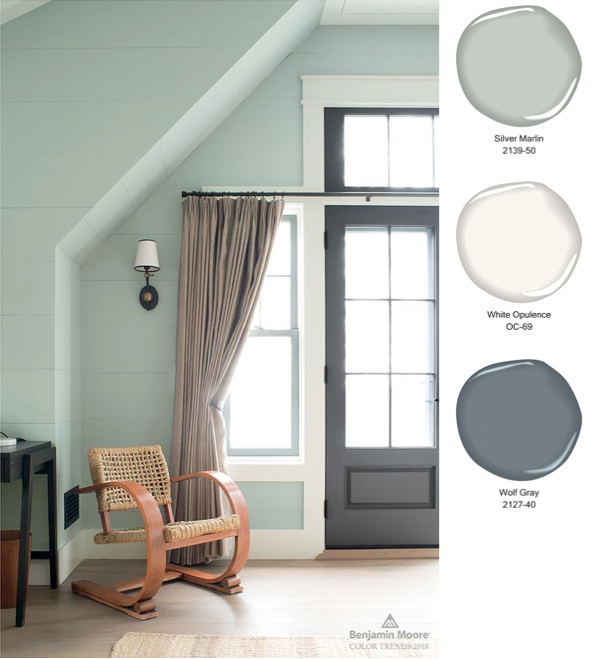 Benjamin Moore, the triangle "M" symbol, Aura, Regal Select, Natura, Green Promise and Gennex are all trademarks of Benjamin Moore & Co.
© 2015 - 2019: All design, text, images and the selection, alteration and arrangement of those elements are the copyright of Shaw Paints Ltd or mentioned third parties, reproduced with their permission.